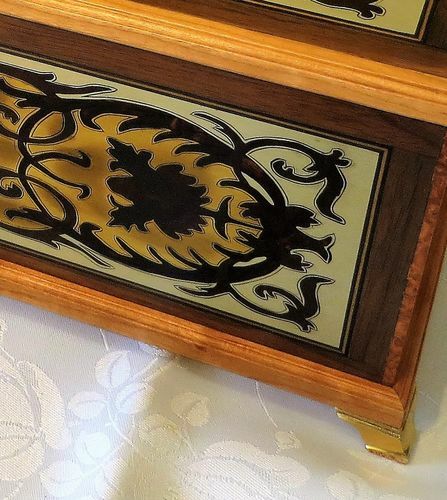 This is the third of my Boulle style marquetry boxes. The marquetry panels for this and the three others where produced by stack cutting a sandwich of materials on a chevalat. With the parts interchanged you get as many different color combinations of the design as there are materials in the stack. 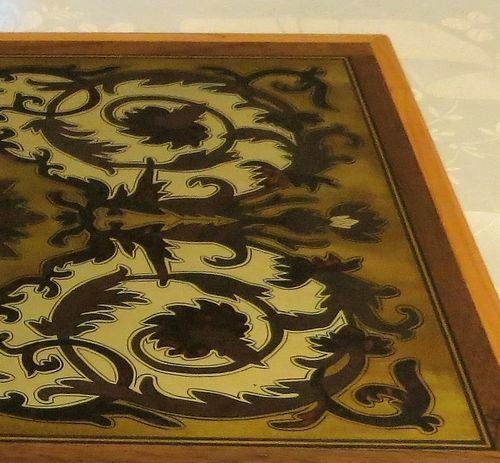 This one has a brass and pewter background, with ‘tortoise shell’, jarrah and ‘ebony’, details. The metal parts are engraved to add detail to the design. It is a contra partie design – a dark coloured design set into a light background. Cheery veneer is used for the interior with solid cherry for the removable trays, and drawers, with cherry and walnut for the edgings. This one has three removable trays and five small drawers, three of which are hidden behind a false side. It is lined with a dark blue coloured goat skin. All of your boxes are Outstanding…....I am real curious as to the size of those boxes?? Madburg – stunning boxes. The exteriors are beautiful, and the interior layouts are excellent designs. I like they tray concept, plus the back layer of drawers … what an excellent detail. Exceptional work, this is truly an heirloom piece. Thanks for the feedback guys. For MontanaBob the boxes overall are 350mm (14”) x 250mm (10”) x 150mm (6”) which was dictated by the size of the brass sheet I could get. The shets were 300mm (12”) square, so with the boarders and stringing added you can see there was no wasted brass. Ditto statement on box 1! Wow! You did a beautiful job. Wonderfull work, I love boulle as a style. It’s very classy when done right. I look forward to reading your blog and hopefully seeing your chevalier. Yeah, just fantastic. All your boxes blow me away! This box is such an outstanding piece and displays a lot of nice details and craftsmanship. just beautiful. all of them. wow! Gorgeous! I hope to one day develop my skills to that caliber! Terrific box and great workmanship. Thanks one and all. Interesting that this one got the most comments so far. It is currently on the bench being stripped and re-polished – a bit like a restoration. When I polished the boxes I used a brush on satin polyurethane. But due to the black paint that fills the engraving lines, I was worried that if I brushed the poly on it would drag the paint out and possibly make a mess!!! So, for the first coat I used a spray-on, made by the same manufacturer, to seal it I thought. I then applied umpteen coats of brush-on, carefully rubbing down between coats, to make sure I didn’t rub through the poly. Well a week or so into the process, I noticed that the brass was starting to look very dull and a dark ‘bloom’ was spreading over it. Not so with the pewter. a similar thing was happening to Mattie as well, but not quite so bad. Karen and Charlotte while they lost a bit of shine from the brass and pewter were OK.
At first I thought “Oh it just makes them look more authentic and antique! !” But Martha got worse so I decided to strip off the poly and start again. What I think had happened was two things: 1. I didn’t leave the finished filled engraving long enough to really harden off before I sprayed on the first coat, and 2. I possibly sprayed on too much, and the excess solvent leached out the black pigments from the paint.